How cute is my clear storage btw? 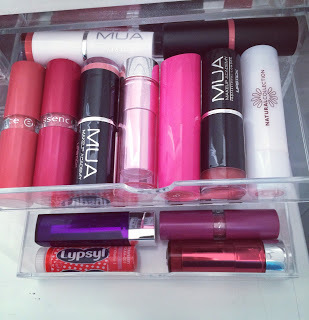 I don’t have much make-up so everything I have fits into these three sets of acrylic drawers! Anyway, I just want to put this out there to start with: I am not a beauty blogger. 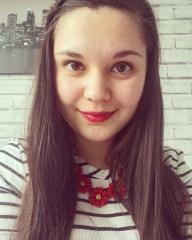 I’m just a regular girl who likes make-up. I don’t always wear it and most of the time when I do, I don’t experiment very much. I like a smoky eye or a strong lip sometimes but not often. I do not buy high end products such as MAC because 1. I can’t afford it and 2. I don’t think I would get the use out of their best products like lipstick. 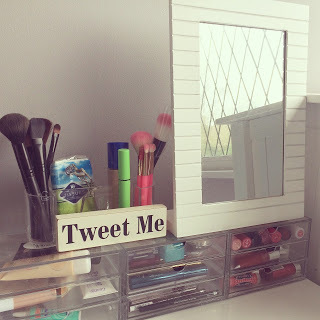 I only spend about 10-15 minutes doing my make-up because I have a set routine that’s work for years for me and to be honest, I’m quite crap at doing make-up so I just stick to what I know. Because of my childhood in dance, I started wearing make-up from a young age (about 3) so I’ve tried tonnes of makes and products. However, having eczema and sensitive skin means that there are many brands I cannot use as I’ve had a reaction to them in the past. 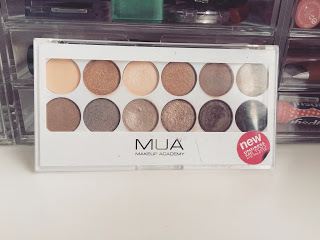 I rarely venture into trying new brands unless the product gets discontinued! 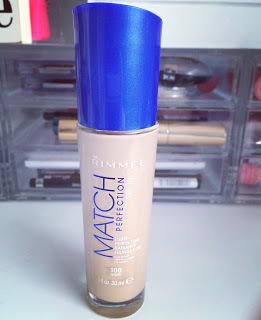 This Rimmel London Match Perfection foundation has been a staple of mine for about 5 years now I think! I love that it is just the right thickness to cover my skin but not too thick that it looks cake-y. It was also perfect for stage make-up as two layers of this make you look tanned! I apply this with a brush first and then use a sponge to smooth it out. 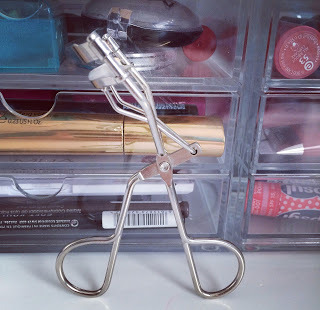 My eyes are one of my favourite features so an eyelash curler is a must for me. I don’t buy an expensive one as I feel that the cheaper ones do me just fine. I normally hold it in place for about 15-20 seconds before applying mascara. My No. 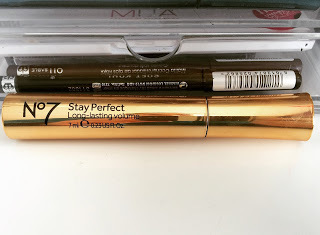 7 Stay Perfect mascara is the most luxury item I have in my make-up stash. After Rimmel discontinued my former favourite, I had to shop around for a new one. I wanted a small, plastic comb type of wand and after nipping into Boots on a dinner (I work opposite one! ), I came across this beauty. The packaging grabbed me straight away and the wand was everything I’d ever dreamed of. Thanks to the Boots voucher I had and the BOGOF, two of them didn’t cost me much at all! 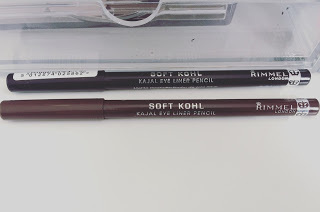 I have been buying this Rimmel London kohl pencil since I was 7 and have never, ever tried any other brand since. I used to use it for black wings at the side of my eyes (dancers, you’ll know!) and then found more uses for it as I got older. I don’t think I will ever start buying a different eyeliner ever! No Naked palette for me! This MUA one is more than enough for me; I love the range of browns which I tend to stick with anyway. Even when I do a smoky eye, I keep it in the brown family as black and grey makes me look extremely washed out! In the past few months, I seem to have accumulated a lot of lipsticks; however because I buy them and often don’t wear them again, I just buy cheap ones! I love the Essence range in Wilko and MUA for lipsticks. I invested in a red Rimmel one because that is the only colour that I think you can tell if someone is wearing a cheap lipstick or not. 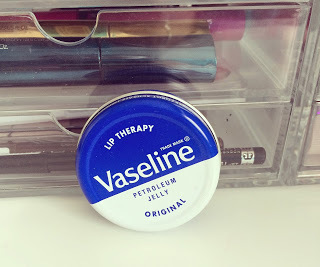 My number one beauty item will always be Vaseline! Even if I have no other make-up on me, I always have a pot of this in my bag. Most of the time I wear a bright lip but on the occasions I wear more eye make-up, a simple clear glossy lip will always look perfect with it and this is my clear gloss!